Timi Frank, a chieftain of the All Progressives Congress (APC), says it is time for John Oyegun, national chairman of the ruling party, to retire from politics. 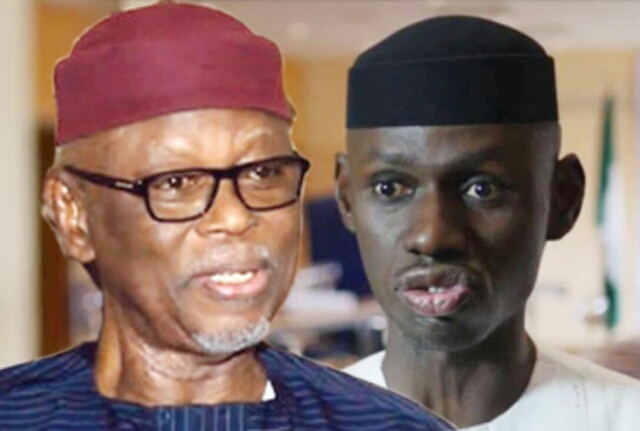 Frank’s comment comes on the heels of President Muhammadu Buhari’s position that the tenure extension of Oyegun and other members of the national working committee (NWC) is unconstitutional. In a statement on Thursday, Frank said Oyegun should resign before “he disgraces president Buhari”. He said: “Oyegun should honourably resign his position to embrace farming in his hometown instead of politics. “I’m telling chief Oyegun to retire now before he disgrace president Buhari because it is shameful and disgraceful for NWC to say Buhari is not the leader of the APC. This is a way of disgracing him before Nigerians and the entire world that President has no say in his own party. “I remember several times the party under Chief Oyegun could not hold a meeting, not to talk of taking any decision because the President, who they claimed to be a leader of the party then was not available. “So, we want to know what has changed now? When it is time to take a decision in their favour, Buhari is the leader of APC but when the president took a certain decision against Oyegun and his NWC, Buhari is no longer the leader. This is an embarrassment to the president. He commended Buhari for his opposition to the “illegality” and added that he has no regret for opposing Oyegun’s style of leadership. Despite the president’s standpoint on the matter, Bolaji Abdullahi, spokesman of the APC, had said the tenure extension of the NWC still stands. A committee has been set up to look into the president’s concerns.